In May I am taking my grandson on a trip to the U.S.S. Intrepid in New York. 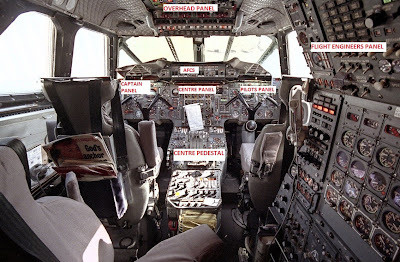 Among all the aircraft displayed on her flight deck I most want him to see the Concorde, British Airways G-Boad. Hopefully I will be able to get some great photos, inside and out. I never got to see the Concorde up close on the ground. The only time I ever seen one was while I was out for a run one summer day. I saw a Concorde orbiting in the holding pattern over the East Texas VOR (eastern Pennsylvania), on one of its extended legs it passed over my home area. It made about two orbits then disappeared to the south. I don't know if it was Kennedy bound or Washington Dulles. There were many Thunderstorms in the area that day. But it was still pretty cool to see it orbiting the area. 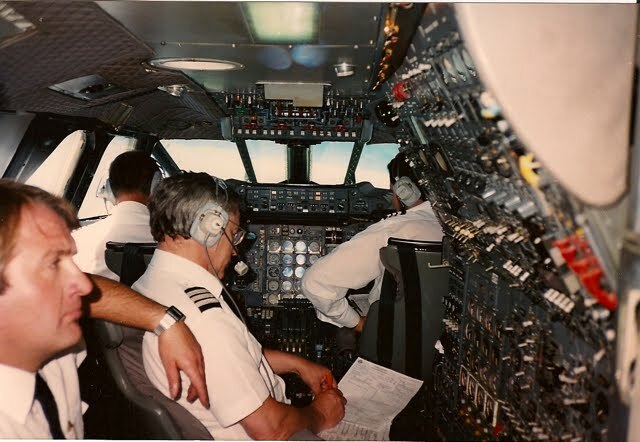 Below are a few articles on the Concorde from the archives of Flight Global. 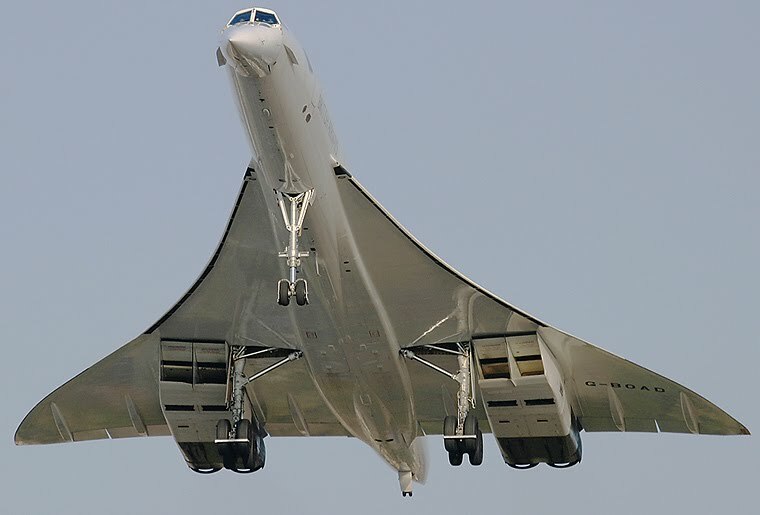 I AM EXPECTING Concorde to be a very nice aircraft to fly. visible to all crew members. from localiser or INS is displayed. used when fuel is transferred to trim the aircraft. where they can readily be seen by the three crew members. Beneath the engine instruments are the three inertial controllers. will probably be moved to the rear. throttle after given time to 500ft/min climb. becomes supersonic at 29,000ft, 80 miles from London Airport. needed. Fuel is moved to trim the aircraft during acceleration. A cruise climb at optimum Mach number will be flown. the start of acceleration of aircraft as necessary. (the aircraft has no spoiler airbrakes). to display this on the Attitude Direction Indicator (ADI). projectors, view graphs, wall charts or working models. the appropriate one of four buttons at each desk. (AFCS) recreates the glareshield panel of the aircraft. intensive instruction in the aircraft's systems. the technical examination for the type rating (the "ARB"
lacks the motion and responses of a simulator. having tendered separately to the airlines and the manufacturer. of flying training on the real aircraft. R2000A computers and the visual system. diagonal represents one hour of supersonic cruise. needed when docking the real aircraft. actual aircraft to less than lOhr before qualification. and power adjustments to produce the required effect. and making the approach by visual references from 1,200ft. seconds of ground roll before the time came to rotate. Correct attitude for the Vj climb. after a Few minutes at the controls. laterally light, leading to some rocking. 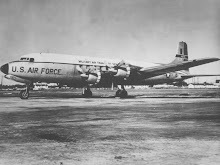 for an age before the nosewheel was on the runway. realistic, with the end of the runway approaching fast. the real Concorde. Without having handled the aircraft. flaps or spoilers to worry about) the aircraft is lined up. I advance the throttles fully and switch on the reheat. the same on Concorde as they are on other jet aircraft. speed the drag and resultant fuel penalty would be significant. found it easier than on the subsonic jets I am used to. as the subsonic jets, they really go flashing past. shows a reading of instantaneous weight and e.g. position. load and trim sheet from the traffic branch of the airline-. are closed to decelerate and Concorde descends at 325kt. are lowered (visibility is good, even with them raised). ground, it feels perfectly normal. Concerning your Concorde visit, if you have a choice, try to see the one at Seattle's Museum of Flight. It is open for a walkthru - board at the mid-cabin door, walk forward, look into the flight deck door, then exit the forward door. Included in Museum admission; the Intrepid charges $20 extra for you, $15 for your grandson. The Seattle airplane has all its engines; the one in New York does not. You can also walk thru the original VC-137, a 707-100 first used by President Eisenhower.